Just got my new Retina Macbook, complete with all the ugly default icons, in their full 2x glory. I decided I wanted to find a cleaner looking icon set. After a small search, I stumbled upon app.icns, an amazing icon set by Andrew McCarthy and Kara Zichittella. With a few custom additions of my own, I had a much cleaner dock to work from. First off, I downloaded the iconset and opened it with Candybar. 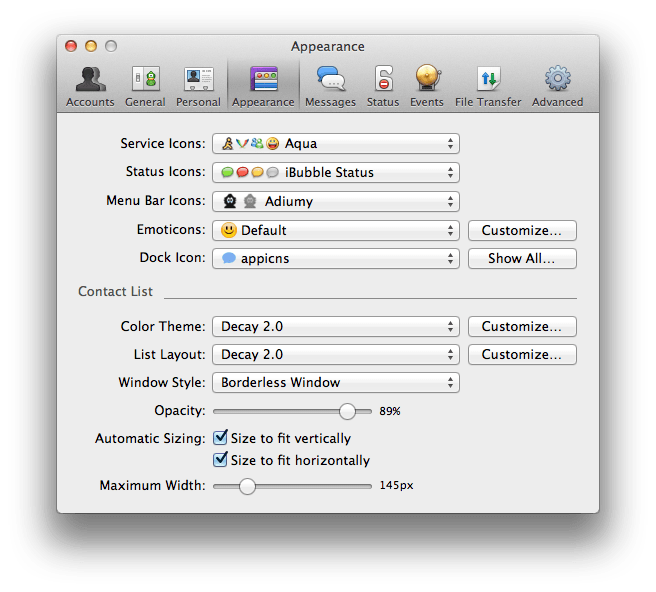 This is a nifty tool by Panic for managing and updating icons in OSX. They no longer support it, however this also means its free! I believe they are handing the reigns over to Iconfactory, so we’ll see what the future holds. 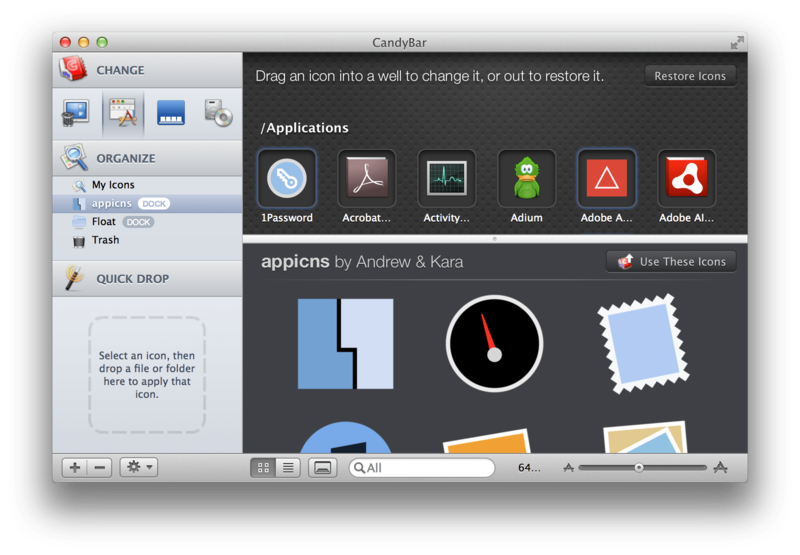 Candybar is pretty baller, and works decently well with Mountain Lion. You can select your iconset on the left, and apply all of them at once to system and application icons. App icons just require a reset of the dock, where the system icons seem to need a reboot of your machine to show up. While the set of icons at app.icns is quite robust, I needed some more to fill out my dock. Here are some links to icons I’ve created in addition to some others done by some great people around the net. Most are PNGs, and they can be added to your icons simply by downloading them and moving them into Candybar. This all worked great on my desktop, however, as stated above, I had just gotten my hands on a brand new retina machine, and with that new bundle of joy came challenges. I noticed on my new glorious screen that a few system icons were reverting back to the originals in my dock. What gives? Now, let’s use the finder icon as an example. If you search the directory, you’ll find both finder.png and finder@2x.png. Looks like Apple is appending anything for their retina screens with @2x. Just overwrite that png with the same you are using for the non-retina icon, and you should be good to go. So now that we have our retina issues resolved, let’s tackle Adium. This lovely chat program using an icon set for the multiple states in the dock, so just uploading the icon with Candybar isn’t going to cut it. Your icon will be there in all its glory… until you actually use the app. No good. What you need to do is setup a dock icon set that handles the different states in the app, such as asleep, awake, invisible etc. I’ve taken the liberty to create one, and you can download it here. Just click install, and you are good to go. If you want to set them manually, you can find them under Preferences > Dock Icon. Some of these icons, like Adium above, need some fenangling to get working. Some also need to be done manually as an admin user (or using sudo), such as Xcode. I’ve also noticed that some revert back when the apps get updated. If anyone knows a way around that, please comment or hit me up on twitter. Same goes for if you have any questions! This is sweet. I’ve got CandyBar and new app.icns avec your additions! A few stragglers but maybe a restart is due. Thank you sir! Glad to help. If you have any ideas for more icons, feel free to for the repo. “Looks like Apple is prepend­ing any­thing for their retina screens with @2x.” Small typo: You mean ‘appending‘. Ahhhh, thanks Jezen! I appreciate someone who takes the time to use correct sentence structure. Thanks Ashwin! You can pull them down from the Github repo. Also, if you want to create any of your own, feel free to for the repo!